This is our Bulgarian Lavender Flowering Tops Steam Distilled Essential Oil. Herbal Folk Traditional uses for Bulgarian Lavender Flowering Tops include soothing the stomach, repelling insects, reviving, soothing the mind and calming the spirit. Bulgarian Lavender Flowering Tops is probably the most used of essential oils. It is the gentlest oil and therefore is used by many mothers for their babies and young children. It has a sweet floral scent that is smooth and herbaceous. Bulgarian Lavender Flowering Tops blends well with Bergamot, Cedarwood, Chamomile, Citronella, Clary Sage, Clove, Geranium, Jasmine, Laurel Leaf, Lemon, Mandarin, Oakmoss, Orange, Patchouli, Rose, Rosemary, Thyme and Vetiver. Bulgarian Lavender is famous for its high quality and purity. Although French Lavender is also highly regarded, France imports a large amount of Bulgarian Lavender to use in their Lavender Essential Oil production. Thus France exports more Lavender Essential Oil than it produces. 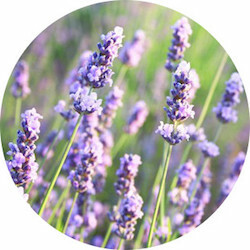 Bulgaria Lavender comes from northern Bulgaria which is referred to as the Garden of Lavender. When I first started learning about essential oils in 1995, I began using lavender essential oil on my face in place of my previous skin regimen, wild aloe leaves. My then husband went out of town to work for a week and when he came home he said my face looked different, younger than before he left. I have used lavender on my face all these years and still get compliments on my skin. I have used lavender essential oil on my children when they were babies to soothe hot skin when we have really hot weather in Florida, for occasional sunburn, for adding to homemade body lotion, for cuts and abrasions, for teething and as a totally natural underarm deodorant. Bulgarian Lavender Flowering Tops Essential Oil is also used as an antiseptic ointment and fragrance, soaps, lotions, perfumes. Lavender Essential Oil has the following actions: analgesic, anti-convulsive, antidepressant, antimicrobial, anti-rheumatic, antiseptic, antispasmodic, anti-toxic, carminative, cholagogue, choleretic, cicatrizant, cordial, cytophylactic, deodorant, diuretic, emmenagogue, hypotensive, insecticidal, nervine, parasiticide, rubefacient, sedative, stimulant, sudorific, tonic, vermifuge and vulnerary. 1/2 ounce. Bottled in brown glass.